McCormick Prof. Karen Smilowitz and Northwestern students work at the Bank of America Shamrock Shuffle in March. The research team will use the dashboard it has developed for data analysis at the Bank of America Chicago Marathon on Sunday. An interdisciplinary team of Northwestern researchers is using data analytics to study and improve the Bank of America Chicago Marathon, which attracts about 45,000 runners and 1.7 million spectators each year. 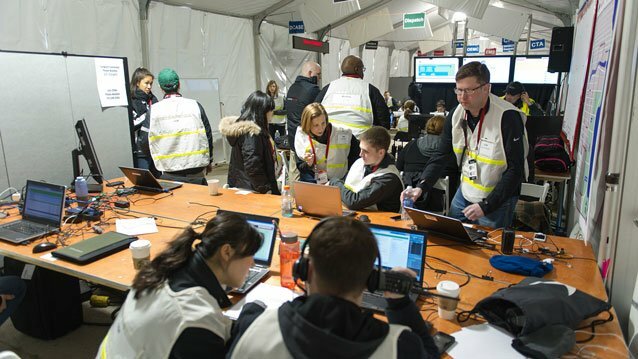 Using a visual dashboard they developed that gathers data about the race’s medical tents, the weather and other variables, they hope to improve the race’s course design and preparedness to handle medical, safety and security issues. The team’s research began about two years ago to not only collaborate between different disciplines, but to give students an accessible way to do field work near campus. The marathon’s staff is made up of officials from Chicago’s police, fire and emergency management departments and the Red Cross. McCormick Prof. Karen Smilowitz, one of the research team’s investigators, explained that the staff already has a well-organized information system in place, so NU’s role is to analyze the data. Feinberg Prof. George Chiampas, medical director of the Chicago Marathon since 2007, said he looks forward to the implementation of cutting-edge technology to inform those decisions. The research team includes Chiampas, Smilowitz, Prof. Jennifer Chan of Feinberg’s emergency medicine department, Prof. Sanjay Mehrotra of McCormick’s industrial engineering and management sciences department and several graduate and undergraduate students from both medical and engineering backgrounds. This diversity across disciplines allows for a unique assessment of the marathon, Chan said. “What’s really interesting from a multidisciplinary standpoint is looking at health and injury patterns and patient demographics … and being able to understand how other types of information like weather patterns, geography on the course and other sets of data elements will help people maintain their health and well-being during the marathon,” Chan said. About 10 students will be aiding the researchers at the race on Sunday, Smilowitz said. Smilowitz will give a presentation Thursday to the directors of other major marathons in cities such as Boston, New York City and Tokyo. The data from the Chicago Marathon can help in the planning of large events such as Lollapalooza, Smilowitz said. “It’s really exciting that we get to do things here within our own city of Chicago but also look at how best practices can be deployed at other marathons throughout the world and also at other mass gathering events,” Smilowitz said.